The Winner/Colome baseball team will open the season on the road when they travel to Chamberlain on March 31. The junior varsity game will start at 5:30 p.m. followed by the varsity game. 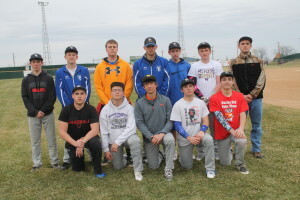 On April 2, the team will play at Parkston as they take on Beresford at 3 p.m. followed by Parkston at 5 p.m. These will be varsity games only. There are 12 returning lettermen on the team. The lettermen include Reed Harter, Holden Thieman, Drew DeMers, Kelly O’Bryan, Ryan Sherman, Ty Bolton, Riley Calhoon, Nick Lantz, Levi McClanahan, Dalton Baker, Carter Brickman and Jeremiah Yeaman. The two seniors on the team are Cameron Biggins and Harter, who is a two time all state shortstop. Others on the team are Noah Cerv, Andrew Laprath, Phillip Jorgensen, Joren Bruun, Loren Moeller, Gage Watson, Jacob Beckers, Kameron Meiners, Oscar Pravecek, Ryder Mortenson, Colby Kaiser, Nathan Monk, Fred Whiting, Aaron Gilchrist, Brady Fritz, Evan Farner, Jesse Colson, Zach Bohnet, Landon Thieman and Owen Duffy. The only player lost from last year’s team is Brandon Bicek. The Royals finished last season with a 12-3 record. There only losses were twice to St. Thomas More and Platte. The Royals were defeated by St. Thomas More in the regional championship game.